Joe Betz is a graduate of the University of Missouri – St. Louis MFA program in Creative Writing. In 2009, he won the Goldstein Prize from Michigan Quarterly Review. In 2010, he won the James Russell Grant Poetry Prize from the University of Missouri – St. Louis. In 2012, he is still writing, this year in Indiana, where he teaches as an adjunct English Instructor. Always, he is thankful you read poetry. This poem is so tight and so tender all at once: tight in a structural sense with lines of three syllables arranged in tercets, but also in its economy of language and detail; tender in its willingness to look away from the shortcomings of its subject (“the blindfold… fits.”). 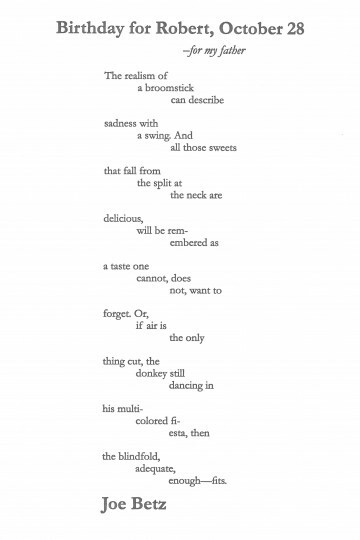 The lines wave back and forth across the page like a child swinging at a piñata, while the poem itself sways between memories of success – “all those sweets” – and failure “air is/ the only// thing cut.” It takes great finesse (and love) to acknowledge the later without blame; the result is a beautiful, bittersweet remembrance. Garamond is one of the most readable typefaces, a style that is at once present and transparent, the letters being clear but not calling attention to themselves. They let the subtle emotion of this poem shine. It’s especially appropriate for another reason: all the current iterations of what we call Garamond are an homage to their progenitors, the Sixteenth Century French printer Claude Garamond, or to Jean Jannon, another, slightly later French printer whose work was mistaken for Garamond’s for many years.